Last Chance Lodge has taken its name from the 1890's Last Chance Mining Company Limited with the old water races now supplying irrigation water to much of the Earnscleugh district. 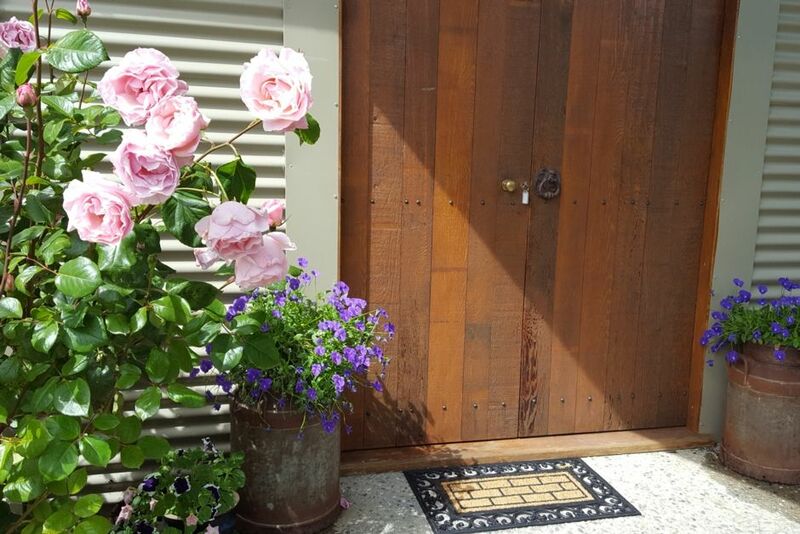 We are situated in the heart of the Earnscleugh wine and fruitgrowing area amidst a picturesque garden with a stunning Central Otago landscape. It is 4km from Alexandra and 8km from Clyde with Queenstown and Wanaka 1 hour away. The Lodge is fully self contained and features contemporary spacious design ideal for relaxation. Heating is provided by a log burner + gas heating. Continental breakfast available on request. Cycle or walk the nearby Alexandra/Clyde Clutha river track or embark on the Central Otago Rail Trail. If you are a biking enthusiast the tracks range from extreme to novice. It is an ideal base for exploring all that Central Otago has to offer. We are in close proximity to the Alexandra/Clyde wedding venues. Do you like fishing and or golf? There are many fishing rivers and dams. It is a golfers paradise with five golf courses within an easy thirty minutes drive (all with reasonably priced green fees). Don't forget to read the member feedback and guest book to see what our guests have said! We have 15, 16 and 17 April (easter) available due to cancellation. 9 k to Clyde village or walk along the Clutha river track. This place oozed charm. It was exciting walking from the car, down under the pergola full of grapes, to the large wooden entry doors. This place was just beautiful. Simple but charming. Beautiful Outlook, lovely River Walk at the doorstep. Slightly rural but still easy 40 minute walk to Alexandra along the river. Beautiful and clean. Cathy was a wonderful host. Someone else's last minute cancellation was our gain. Well be back. Thanks for your reveiw of Last Chance Lodge. Pleased you enjoyed your stay and were appreciative of the surroundings. We feel lucky to live in this piece of paradise. It was a pleasure to meet you and we would love to have you back to stay. Great stay in a lovely bach. Really well kept and clean. This property was just what we were expecting. Perfect for two couples, well equipped and spacious enough for everyone to find a quiet spot to relax in the evening after the day's adventure. We chose this property also because of its proximity to many of the Central Otago attractions. DeeDee and Harry were very knowledgeable stand-in hosts. Their recommendations for Paulina's restaurant in Clyde, Desert Heart winery at Bannockburn and the Sunday market at Cromwell Old Town were spot on. Other highlights of our week were the Flat Top walk with stunning views, the Roxburgh Gorge Bike trail with Bike It Now and a day trip to Naseby and surrounds. Would definitely recommend. Great location, accomodation and hosts! A great spot to stay, we arrived late and it was nice and welcoming to have the lights on. Very quiet and warm (as was the welcome from Cathy the host). Just out of town and in the country amongst some lovely central Otago rocks. We loved our stay at Last Chance Lodge - the peaceful picturesque setting, the spacious living quarters and the gracious host Cathy. The grandchildren delighted in the little dog and the rabbits and the closeness to the river. Perfectly clean and tastefully decorated. We hope to return - a hearty thank you. Lovely property, roomy enough for a family or small group. Lovely property, roomy enough for a family or small group. The outlook is gorgeous and we loved the generous log burner. Direct access to the Clutha and Fraser River including the walkway . Central Otago Rail trail and Roxburgh Gorge cycle trail.